Habitat for Humanity of Nodaway County celebrated the completion of its ninth home and its new owners during a dedication ceremony Feb. 26, 2017. The new home is located at 1315 E. Jenkins St. in Maryville. 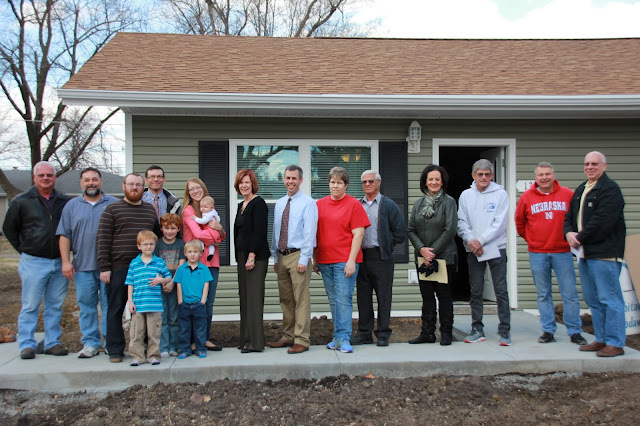 Habitat for Humanity of Nodaway County named the Mullins family as its next partner family at the conclusion of an application process in 2015. Construction on the home began last fall, and a January loan closing allowed the family to take ownership of the home. Joshua Mullins is a teacher and his wife, Alea, stays at the home with their four children. Habitat for Humanity of Nodaway County serves the communities, which consist of Maryville, Elmo, Clearmont, Burlington Junction, Quitman, Skidmore, Graham, Hopkins, Pickering, Ravenwood, Clyde, Conception Junction, Conception, Arkoe, Barnard, Guilford, and Parnell. Habitat for Humanity of Nodaway County is one of more than 50 affiliates and campus chapters in the state of Missouri.